While Statusmonger has most of the necessary travel essentials in his laptop bag, I would like to add two more items to his list. I believe a true global road warriors should have these two items because no road warrior can live without power. Having traveled across the globe for the past decade, I still cannot live without these two items. With these two items, you can leave all the AC power cords home. All you need is to take your USB cord and AC power adapter for your laptop! 1) Universal AC wall adapter – Regardless of your AC power plug’s country of origin, this universal AC wall adapter allows your power plug to be connected to any wall outlet in any country. 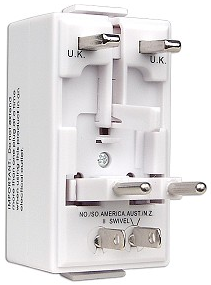 I have used this universal AC adapter in Europe, Asia and Australia. I’ve also lent this universal AC adapter to visitors to the US. The universal AC wall adapter is a cube shape – about 2×4 inches max and very light. The universal AC adapter has two sides. One side that has three different prongs to be plugged into a wall outlet. The other side is a universal wall outlet receiver for your plug power cord. You can purchase the universal AC adapter at Fry’s for less than $20 (or in China). Don’t buy it at Brookstone’s or airport stores because they are opportunists & will rip you off. 2) Car lighter USB charger – Like the universal AC adapter, the car lighter USB charger allows you to charge your electronics wherever you are in the world. Car lighter chargers are standard across the world – probably the only universal power source in the world. This car lighter USB charger turns your car lighter socket into a USB port. All your need to do is plug one end of the charger into any car’s lighter outlet socket. The other end of the car lighter USB charger has a USB female connector which is for the USB cord (just like a computer USB port). When you are on the road or in another country, all you need is a USB cable to plug into the car lighter charger to ensure your mobile phone, iPod, digital camera, etc. are fully charged during your journey. You can leave the extra AC power cords for your Canon camera, Apple iPod, etc. at home. Leverage your PC or rental car for juice! What’s in Your Laptop Bag? 1. The Bag – I have regular North Face backpack that I got in the spring of 2000. It’s nothing special, but it has survived the rigors of college, the demands of the workplace, and the grind of air travel. Yet even after 9 years, it’s still very much intact and sturdy. And still will be for several more years. 2. The Laptop – 15″ MacBook Pro. I became a Mac convert last March after using PCs since 386’s were the cutting edge in personal computing. What took me so long? Mac OS X is the far superior operating system and the Apple Macintosh is a very fine machine. A bit pricey but definitely worth it. 3. The Other Electronic Device – Canon Powershot SD500. Sometimes my iPhone camera will just not do. 4. The Peripherals – I carry all my laptop peripherals in a nylon bag with many pockets about the size of a large fanny pack that I bought from Walgreens. It’s pretty ugly but serves its purpose. a) Power Adapter for MacBook Pro – For obvious reasons. b) Ethernet Cable – Sometimes you have to go wired. c) Kensington Security Cable – If I’m in a public place and have to leave my laptop to go somewhere even briefly, I always make sure to lock down my laptop. d) Mouse, Travel-Size – I rarely use this, however, now that I’m on a MacBook. e) USB Cable for iPhone – To charge my sorry iPhone battery. f) 2GB Flash Drive – Emailing 700MB AVI files do not work. g) DVI to VGA Display Adapter – Sometimes I will need to connect my MacBook to a projector to give those cliche powerpoint presentations. h) USB Cable for Digital Camera – For those times on the road I need to transfer that pic to my laptop in order to email proof that Jessica Alba shared the elevator with me. i) Charger for Digital Camera – I’ve had too many instances where I turn on my digital camera and it goes dead. j) 4GB iPod Mini – This is not for listening to music. My iPhone is for that. I had no use for this piece of classic hardware. So I decided to turn it into a mini hard drive. This is for the times when a 2GB Flash Drive is not enough. a) Business Cards – …obviously. b) Travel Program Cards – Not just any card from an airline mileage club or a hotel rewards program. These need to be cards that show status. Not so much to show that you have status for a certain travel program but rather to show you have status at a partner travel program. This has come in handy when I had to show that I was Star Alliance Gold when flying on Asiana using my United Premier Executive card or when I used my Amtrak Select Plus card to get into the Continental lounge. c) Health Insurance Card – If I need any medical attention while traveling. d) Clear Card – This is kind of useless as I have only been able to use this at New York’s JFK. e) Regus Gold Card – The Regus Gold Card gets me access to thousands of business lounges across the US. However, the few business lounges I’ve visited have been very disappointing; usually they are just a kitchen area with some chairs and a table. Good thing I didn’t pay for this card; I got it complimentary with the useless Clear Card… figures. f) Gift Certificate Cards – You never know when you need to buy something while traveling… or re-gift them while traveling. g) Backup Credit and Checking Cards – See my post on why this is essential. a) Checkbook – No one writes checks these days but checks are a great substitute for an ATM at hotels. b) Passport – This is not so much so I can go spontaneously to Paris but rather so that I have a government issued ID if I lose my driver’s license while traveling in order to fly back home. c) Collar Stays – If I’m working at a location away from home, I drop off my dry cleaning at that location if I know I’m going to be back the week after. Before dropping my shirts off at the dry cleaners, I always remove the collar stays. They get placed in this large envelope so when I pick my dry cleaning up the week after, I have them to put back in my shirts. Collar stays are essential for a professional look. d) Several US Quarters – Barack said we need change. e) Beverage Coupons on Various Airlines – I need to unwind in the air after a grueling week on the road. 7. Pad and Pens – There are times when I just need to jot or doodle some things down, like when playing Sudoku. 8. Earphones – Occasionally I rely on 2Pac to provide a more suitable work environment.